Shaking Tables | Star Trace Pvt. Ltd. The head motion is of rugged construction and requires minimum maintenance. Its internal mechanism is splash lubricated from an integral oil sump. The decks are built of 16mm zircon-reinforced fiberglass with fabricated steel frames at the bottom and are easy to clean, requiring little maintenance. The specific gravity of fiberglass made into decks is one third of that of steel, while its strength reaches as high as 70% that of steel. This fiberglass deskc also has the characteristic of water-resistance and corrosion -resistance and can hold the shape unchangeable at ±50°C. Concentrating Tables are designed to wet gravity based separation of minerals and other granular materials. 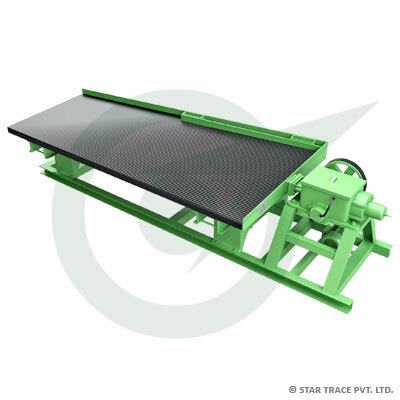 There are many applications where the concentrating table is of particular value and cannot be equaled for economical and efficient performance. They are effective in processing precious and base metal, rare metal and non-metallic minerals.